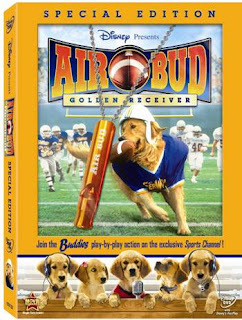 About a week ago, I received in the mail Air Bud: Golden Receivers Special Edition dvd. I was so excited because my daughter (and me, my nephew, my mom, and so on...) fell in love with the Buddies in the movies, Snow Buddies, Space Buddies, and Santa Buddies. Adorable movies in their own right. But they also feature Buddy ~ the dad of the buddies. He originally started it all in Air Bud, a movie about a basketball playing pup. And so she automatically liked him too. Confused yet? No? Ok, good! I'll keep going. In Air Bud: Golden Receivers ~ Buddy's owner a young 13 year old boy is starting high school and dealing with a lot of teen angst. His mom is falling in love and he doesn't like it. So he starts playing football to stay away from home. Which incredibly Buddy also knows how to play. Ok, so we should have seen it coming Buddy did play basketball in the first movie. Anyways, as he plays ball and has to learn how to deal with all the changes going on in his life ~ there is also the fact that they're fighting a couple of animal stealing criminals that have set there sights on Buddy. Air Bud: Golden Receivers hits stores tomorrow February 2nd. • The Buddies Sports Channel – Join Budderball in the broadcasting booth as he and the rest of the Buddies, B-Dawg, Mudbud, Buddha and Rosebud, review the instant replay on the amazing football career of their dad, Air Bud. • Air Bud Sport Whistle Necklace – Exclusive on-pack while supplies last. If you want a cute movie that the entire family will enjoy, this is it! Emira is a HUGE fan of the Air Bud movies! Well any movie with dogs really LOL. She is def not a cat person like me, she loves her dogs. We have 2 pups right now that we have to find homes for, and I know it's going to break her heart. She has taken care of them since they were born.